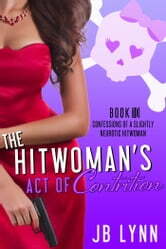 Imagine a high-strung, comfort loving hitwoman at a rustic spiritual retreat. Things are finally looking up for Maggie Lee. Her almost-lover Patrick is taking steps (albeit deadly ones) to insure they’ll have a future together, her niece Katie is about to be released from the hospital, her sister Marlene has stopped turning tricks and started tossing pizzas, and Maggie has a chance to land a new (legal) job. If only God would stop hounding her to apologize to her mother, Maggie would be pretty close to content with her life. When Maggie agrees to take out a new target, using a spiritual retreat as her cover story, she ends up with a spoon (long story), an odd, selectively mute roommate, and a chance to save a life. As Maggie struggles to balance all the important people in her life and deliver on the deadly contract, she begins to believe that God may be right about the act of contrition he’s demanded…but will she live long enough to do it? Great book, love the characters including all the animals. Great series and can’t wait for the next one. As always, JB Lynn delivers another wonderfully humorous installment of the saga of Maggie Lee,reluctant yet capable hitwoman. This time around we're introduced to not one, but two new characters (who this reader hopes will stick around in the future) and Maggie gets to go to a new-age retreat in order to fulfill a contract. Just as in the prior books of the series, JB Lynn manages to combine humor, sadness, romance, and drama all into one package that is Maggie Lee. And a usual, I can't wait for Maggie's next adventure. Another winner in the Slightly Neurotic Hitwoman series. This book is fun and funny while Maggie continues facing a bit too much reality in her life - from becoming Katie's "mom" to killing people for a mobster. And what about romance? Her murder mentor still wants her, but does she want someone who would literally kill for her? Somehow all these tangents make sense and makes you love Maggie even more as you root for her to be successful. This is one of my favorite series and I strongly recommend it. While it is a stand alone novel, the series is so great that you really owe it to yourself to read them all.